The Academy of Motion Picture Arts and Sciences has revealed the first round of presenters who will be handing out the prizes at this year's Oscars ceremony. 2019 will see the telecast go on without a host for the first time in 30 years following the Kevin Hart debacle. But Hollywood's biggest night will still come with plenty of starpower, that much is certain, as the list includes names such as Oscar-winner Brie Larson, our current James Bond Daniel Craig and major up-and-comer Awkwafina. Producer Donna Gigliotti and director Glenn Weiss had this to say in a statement. "The Oscar nominees have generated tremendous worldwide attention through their captivating stories, achievements and performances. We want to give the public an opportunity to once again experience the moments that have moved us all. It is a celebration of our universal love of movies." The full list of presenters announced by The Academy Awards includes Awkwafina, Daniel Craig, Chris Evans, Tina Fey, Whoopi Goldberg, Brie Larson, Jennifer Lopez, Amy Poehler, Maya Rudolph, Amandla Stenberg, Charlize Theron, Tessa Thompson and Constance Wu. Intersting to note, there are just two guys out of eleven woman. How's that for diversity? It was previously reported that the goal was to get as many Marvel stars as possible to present and with Evans, Larson and Thompson on board, it's a good start. 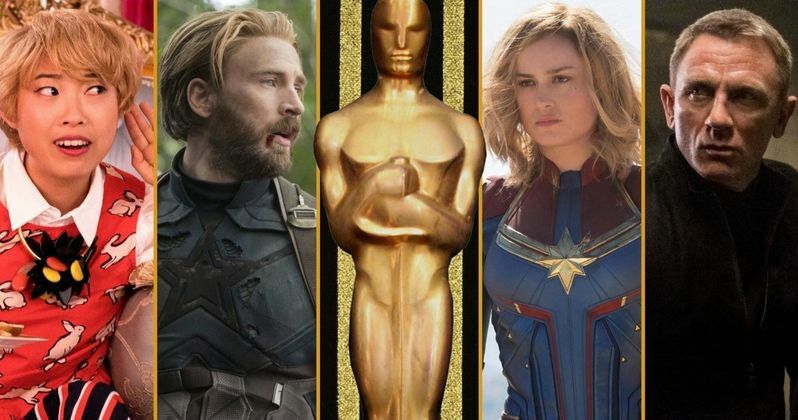 The Academy will be announcing more names in the coming weeks, so they could get some more MCU heroes to join Captain Marvel, Captain America and Valkyrie on stage. Academy CEO Dawn Hudson had this to say. "This is an important moment in Oscar history. This year's show maintains Oscar traditions, and is also evolving to reflect our global audience." The list also includes several favorites who were put forth to host the 91st Oscars ceremony, such as Amy Poehler and Tina Fey. Also of note are both Awkwafina and Constance Wu, who starred in the breakout hit Crazy Rich Asians. Much of this year has been focused on improving the ratings numbers, which is why, for a brief moment, the ceremony almost included a category honoring the best popular movie. Instead, they're going to have presenters from a wide array of popular movies on stage. Academy president John Bailey had this to say. "The Oscars is the most-watched live entertainment event of the year. The show connects us with the power and history of the movies as it reconnects home audiences with their favorite films and stars." Black Panther, Roma, The Favourite, Bohemian Rhapsody, Green Book, A Star Is Born, BlaKkKlansman and Vice will square off for Best Picture this year. Roma and The Favourite lead the pack with 10 nominations each. Black Panther became the first ever comic book movie to score a Best Picture nomination, earning seven noms overall. Given that Marvel's blockbuster grossed $1.3 billion worldwide, to go along with hits like A Star Is Born and Bohemian Rhapsody, even without a host, that could be enough to entice viewers to tune in. The 91st annual Oscars telecast is set for Sunday, February 24.